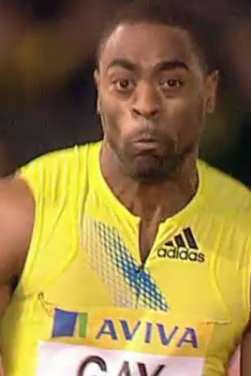 Tyson Gay showed that he is ready to do battle with Usain Bolt this season as he powered to victory over 150m in Manchester. The American competed at the Great City Games for the second year in a row and outclassed the rest of the field; which included Marlon Devonish and Christian Malcolm. Gay pulled away from the rest of the competitors with ease as he clocked a time of 14.50 seconds - and just 8.8 seconds for the first 100m. And while he just missed out on the 150m record that was set by rival Bolt two years ago the American was pleased with his form. Speaking to BBC sport after the race Gay said: "I've missed a lot of training this year because of a couple of little niggles and injuries so I'm pretty impressed with my performance. "I'm feeling OK. I'm a little bit sore, but nothing major. I'm feeling pretty good. I came through the first 100m in 9.91, that's kind of where everyone else is in the world right now so that's now bad. "I'm satisfied with my time, I think it's pretty fast, but I've just got to stay healthy and be ready." This summer will see Gay square up against Bolt once again for the world title with the American looking to regain the title in South Korea.